Stir-fries are probably the most common go-to dinner in this lil’ apartment. Quick to cook, stir-fries are more than ideal for hot summertime kitchens, plus it’s a healthy option and you can mix up the flavours and ingredients and always come up with something special. I know that some people find chopping up so many vegetables tedious, but I find it relaxing. Chopping brightly coloured orange and yellow peppers, cutting the ends of vibrant green beans and pulling out the florets of bright white cauliflower is an almost artistic endeavor for me. I love looking at my handiwork staring back at me in neat little colour-coordinated rows. My summertime kitchen is extra special because the glory of golden hour brings the evening sun into our orange kitchen which bounces off our disco ball hanging by the window. With all the light dancing around the room along with my loud* music**, it’s almost too easy to imagine I’m somewhere exciting and other-worldly. But truth is, I’m quite content in my tiny little orange kitchen and I certainly wouldn’t give up chopping vegetables for the most beautiful food processor in the world. I make many stir-fry variations depending what I’ve got in the kitchen. I usually add tofu or chicken for protein, or I make it a simple vegetables-only affair. And of course, use what veggies you’ve got in the crisper. I usually add some orange or pineapple juice to the sauce but this evening I decided to use a grapefruit that had found hidden away in the vegetable crisper. The stir-fry didn’t have a strong grapefruit flavour, but I like adding fruit juice instead of adding vegetable broth because I think it adds an extra depth to the fresh flavour to the meal. What can I say, I like things with a touch of sweetness! 1. Mix together the sauce ingredients and set aside. 2. In a wok or large pan, heat up oil and add garlic and onions and heat until translucent. Add chicken and use tongs to stir it all about for about 8 minutes until the chicken is cooked through. 3. Add the cauliflower and 1 T of soy sauce into the pan. After a few minutes, add the green beans and then the peppers, stirring everything about. 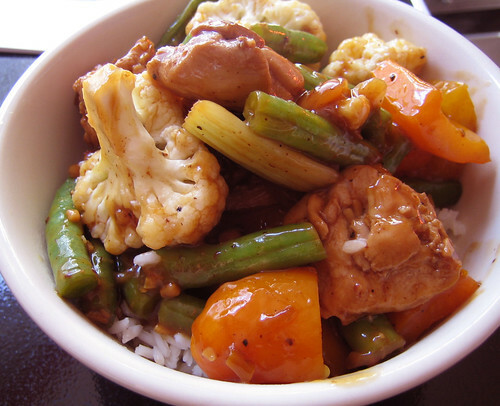 When the vegetables look bright and tender-crisp, give the sauce one last stir and add it to the wok. Again, toss everything about so that everything is well coated and the sauce begins to thicken. Remove from heat and serve over rice or Chinese noodles. Today’s musical selection provided by local Vancouver band, The Pink Mountaintops. There are a few mp3’s online at their label site, but really, do yourself the favour & buy both cds. Oh yes, stir-fries are great! I’ve linked your recipe up in my blog. Hope it’ll give great inputs to the readers. Thanks! Stir-frys are the most common menu item around our house too, especially when there’s team work – one person for chopping (not usually me) one for cooking. And pink mountaintops are my favorite! There’s really no other way to play them but very loud! I just found your lovely blog through mindless linking. Oddly enough I too am in Vancouver. I’ll add a link to yours from mine http://www.woodenapples.wordpress.com. What is it about chopping? I find it extremely relaxing, so weird. I never understand why people don’t enjoy cooking – it can be so meditative and thoughtful. And your stirfry looks dee-licious! Thanks Nadine for the link! Laural, you are lucky to have a helping hand 🙂 And I agree completely on the Pink Mountaintops. So good loud! Rorie, we are on the same chopping team I think! It is meditative and thoughtful and it makes me sad that others see it has WORK. Oh well. Thanks Amy, your blog is deelightful too! It’s always nice to find another Vancouverite on the web. Do you think you can substitute orange for the grapefruit??? I was just thinking how yummy this looks and I have everything in my frige and pantry to make but the grapefruit…. I guess I could always pick one up… but for those times when you don’t feel like running to the store for one plump grapefruit…do you think an orange or some orange juice would do the trick??? Hmmmmm… curious? You need a button…I copied 2 of your recent recipes down but I wish you had a button to copy so I can put at the top of my recipes that they are from “Everybody Like Sandwiches”. I want to give credit where credit is due dah-ling. I need a button! Rachel, yes of course you can sub an orange. This recipe is all about the substitutions. Play around and have fun. I made this recipe last night for dinner. My 3 year old loved it as did I and I had my brother come over and try it out. It was de-lish! Thanks! Oh, and I used the orange juice, added some ginger but only 4 cloves of garlic- should have used 6 like you said but it was awesome. Thanks!!! awesome, glad it turned out so well rachel!! Hmmm, this looks delicious. Thanks for the sauce recipe. I find mine is always runny. It doesn’t stick to the veggies. Monique, if your sauces are too thin, add a bit more cornstarch…it always seems to do the trick.